André Greipel continued what is his best ever start to the Tour de France and extended his lead in the points competition. However, he will have a hard time defending his status as unbeaten in the sprints in tomorrow's stage where a rough ride along the coast ends with a tough uphill sprint in Le Havre where the puncheurs are expected to shine. The Giro d’Italia and the Vuelta a Espana are famously known for their many stage finishers on short, steep climbs and those finales have made the two smaller grand tours big targets for the puncheurs. Things have been different at the Tour de France where the geography has made it harder for the organizers to find that kind of finales and so the French race has been more geared towards the pure sprinters. This year ASO have taken an innovative approach to change the usual script. They have designed a first week that can be described as a series of classics and this year the puncheurs will have just as many opportunities as the fast finishers in the first part of the race. Before the riders get to the first rest day, three stages seem destined to end in bunch sprint but another three stages end on short punchy climbs. However, the three finales on the Mur de Huy, in Le Havre and the Mur de Bretagne are all different, with the steep Mur de Huy being more for the punchy climbers and Ardennes specialists, the Cote d’Ingouville in Le Havre being for strong uphill sprinters and the Mur de Bretagne being somewhere in between. The Le Havre stage comes on day 6 and in addition to featuring a nasty finale, it will be a very nervous affair as the second half takes place along the coast where the wind always poses a huge threat. Furthermore, the coastal road in this part of France is deceptively lumpy and is almost always up and down, meaning that it will definitely not be a day for the pure sprinters. The toughness of these roads were last put on show in 2012 when the riders also tackled a few stages in this area, with Peter Sagan, Edvald Boasson Hagen and Mark Cavendish all shining in the hard terrain. The stage brings the riders over 191.5km from Abbeville to Le Havre and consists of a long southwesterly run towards Bretagne. The first part of the stage is mainly flat with just a few rolling hills but the racing gets serious in the city of Dieppe at the 67.5km mark. From here, the rest of the stage will take place on the coastal road with just a very short digression between the feed zone and the intermediate sprint. After Dieppe, the roads are rarely completely flat. Instead, it is littered with short climbs of which three are categorized. The category 3 Cote de Dieppe (1.8km, 4%) and Cote de Pourville-sur-Nere (2km, 4.5%) come in quick succession at the 72km and 77.5km mark. The final categorized climb comes much later at the 162km mark where the riders will go up the category 4 Cote du Tilleul (1.6km, 5.6%) but in between there are at least seven small climbs that are clearly visible on the stage profile. One of them will be the scene of the intermediate sprint at the 145.5km mark where the riders will fight on a 2km straight road that is constantly uphill, with the final kilometre averaging 3.2%. After the top of the Cote du Tilleul, the terrain gets a bit easier for most of the final 29.5km as it is mainly flat until the riders go down a small descent with 7km to go. From there the coastal road is flat as the riders enter Le Havre before they leave the sea by taking two sharp turns in quick succession just before the 3km to go mark. 700m later there are another two consecutive bends that lead to the bottom of the Cote d’Ingouville with 1.5km to go. The short 850m climb has a 7% average gradient and includes a right-hand turn with 1200m to go. The climb ends around 500m from the finish and from there it is only slightly uphill with a gradient of around 1%, with a very slight bend coming 400m from the line on the 6.5m wide road. Le Havre has not hosted a Tour de France stage for more than a decade. While the riders were lucky to have dry conditions on the cobbles, they have not been spared anything in the two other flat road stages. Stages 2 and 5 both had treacherous conditions and if tomorrow’s stage along the Normandy coast had had similar weather, it would have been a very nervous and selective affair. However, many riders will be pleased to learn that Bretagne and Normandy enjoy summerlike condition at the moment and tomorrow should be a perfect day for a bike race. It will be bright sunshine all day and the only fly in the ointment is the relatively low maximum temperature of just 18 degrees at the finish in Le Havre. More importantly, there will only be a light wind from a northwesterly direction. This means that the riders will have a crosswind for most of the day. As it will turn to a northerly win towards the end of the stage, the riders will mainly have a cross-tailwind in the finale. The late turns with 3.5km to go will see the riders turn into a headwind and there will be a crosswind on the finishing straight. André Greipel and Peter Sagan have dominated the first two sprints of the race and are involved in an exciting battle for the green jersey. Today the German again took the win but like in stage 2 it actually seemed like the Slovakian was the fastest. The Tinkoff star will be keen to make amends tomorrow where an uphill finish should provide him with a better chance and the full amount of 50 points at the finish, he will be keen to move into green. While most riders have had their eyes on the first three days that were like a mini Gent-Wevelgem, a mini Fleche Wallonne and a mini Paris-Roubaix, the dangers in the rest of the first week have got less attention. One of the potential threats that have flown under the radar is tomorrow’s stage to Le Havre. The ride along the Normandy coast could be a possibility to split things as the combination of wind and short climbs with little flat roads can do a lot of damage. Hence, many riders have been looking to this day with some anxiousness. However, they have been saved by the weather gods. After today’s nervous stage where they were not spared anything when it comes to horrendous conditions, they will be pleased to get to the western part of France where summerlike conditions reign. That will make tomorrow’s stage much less nervous and dangerous that it could have potentially been. At the same time, it promises to be a very exciting finale. In the last few years, the organizers have been on a constant search for this kind of uphill finishes that can break the monotony of a first week dominated by sprint finishes. This year the sprinters definitely feel that they have taken it one step too far as there are only five potential flat sprints. However, riders like John Degenkolb, Peter Sagan and Michael Matthews have red-circled this stage as one of their best opportunities of the entire race. This means that there is little chance for a breakaway to make it to the finish. Matthews is set back by injury and is not in a condition to play any role in the finale. However, Degenkolb was hugely frustrated to miss out on the cobbles and this is probably his best opportunity in the final part of the race. Hence, Giant-Alpecin will leave nothing to chance. If one rider can win all three KOM sprints, the mountains jersey is up for grabs and this means that we might see a few more riders keen on an attack than we saw in today’s stage where it made absolutely no sense to join a breakaway. Still we expect the first attack of the day to be the one that works as most know that it is best to save energy for later when fatigue has set in and the terrain is harder. We expect a small breakaway with riders from Bretagne who are close to their home roads, Europcar, Cofidis, IAM, Bora-Argon 18 and maybe Lotto Soudal. It will be interesting to see how Etixx-QuickStep will approach this stage. The finale is probably too hard for Mark Cavendish so they are unlikely to do all the chase work as they always have to carry the main responsibility on the flat stages. If they can allow a group of non-dangerous riders to get clear, they will probably only set a controlling pace until they get some assistance from Giant-Alpecin. Even though Michael Matthews won’t play a role, it is still a good opportunity for Michael Albasini so Orica-GreenEDGE might also lend a hand. The same goes for Katusha as Alexander Kristoff is still in search of a stage win even though the finale is tailor-made for him. Finally, it is also a good opportunity for Bryan Coquard and so Europcar may come to the fore too. The wind is very unlikely to split the field but as it will be a crosswind and crashes could easily make gaps on these narrow, lumpy roads, positioning will still be very important. Hence, it will be another big fight for position where it will be important to be attentive all day. That should automatically make it another fast day where the sprint teams will be swarmed by the GC teams and so they do not necessarily have to do a lot of chase work. Hence, the break will be brought back almost automatically and it will be very hard to stay away until they get to the final KOM sprint. They may even be brought back before the intermediate sprint with 46km to go. That sprint will be an interesting challenge. As it is uphill, it won’t be easy to do it at 80% to just secure a solid number of points without going too deep. Furthermore, it comes relatively close to the finish so it will be difficult to find out how much energy to spend. In any case, John Degenkolb, André Greipel, Bryan Coquard, Mark Cavendish and Peter Sagan who are all aiming for green, should be up there. In the finale, things will get very nervous. It will be very important to be in a good position at the bottom of the Cote d’Ingouville and so to get through the two turns with 3km to go near the front. That goes for both the sprinters and the GC riders and it will be a very hectic run-in to the finish. Many riders will sit up in this kind of finale and so it will be important not to be caught out in a split. In the end, the stage is likely to be decided in an uphill sprint and the finale is pretty hard to gauge. A climb of 850m with an average gradient of 7% is pretty tough and will take the sting out of the legs for most of the sprinters. The finishing straight is only slightly uphill but the tough climb will make it too hard for the pure sprinters. However, there is always a risk in the final kilometre where a strong rider can make an attack if the pace goes down after the summit of the climb. With little domestique resources left, it won’t be easy to bring a solid attack back to set up a sprint. A few years ago Peter Sagan would have been nearly unbeatable in this kind of finale but things have changed for the Slovakian who has been through a hard time. However, the Tour of California signaled the start of a return to form for Sagan who has been close to his best in the last few races. In this race he has been very strong. He doesn’t seem to be climbing as well as he did in 2013 when he was hugely impressive in the Tour de Suisse but we have been very impressed by his sprinting. Usually, he is not fast enough to match the likes of Cavendish and Greipel but he nearly beat both of them in stage 2. Of course he benefited from the fact that it had been a very hard day but his sprint in stage 4 was just as impressive. In both stages, he had had to do a big effort in the finale but was still one of the strongest in the sprint. Today he did an amazing sprint and was agaonizingly close to the win. He was very fast in the Tour de Suisse too. This stage suits him very well. He would have preferred the finish to be located at the top of the climb as the easier final kilometre suits the likes of Degenkolb and Kristoff a bit better. However, he should be the freshest when they get to the top and at the moment he seems to be very close to matching the speed of those two riders. Furthermore, he is great at positioning himself. He won’t have a team to bring back any late attacks but if it comes down to a sprint, he will be the man to beat. His biggest rival is likely to be John Degenkolb. The German proved on the cobbles and with a good time trial that he is in good condition and this stage suits him really well. In last year’s Vuelta, he survived some very tough climbing and he can overcome much bigger obstacles than one would think for such a big guy. If the finish had been at the top of the climb, he would not have been one of the biggest favourites but the very slightly rising finishing straight suits him down to the ground. Furthermore, there are not many turns in the finale and that is perfect for a power sprinter like Degenkolb. On paper, he is faster than Sagan in this kind of sprint but the climb should leave the Slovakian a bit fresher and Sagan has been faster in this race. Furthermore, Degenkolb is not always very good at positioning himself. He will miss Tom Dumoulin who would have been a very good lead-out man in this kind of finale but should still be able to rely on Simon Geschke, Georg Preidler and Warren Barguil to bring a late break back. An in-form Degenkolb could not have designed a much better finale and will be eager to finally take that elusive first Tour stage win. The big dark horse is Alexander Kristoff. On paper, this finale is probably a bit too tough for the Norwegian but it won’t be impossible for him to win. The climb is similar to a Tour of Flanders climb where Kristoff is usually among the strongest. However, the sprint comes right after the top of the climb and it is likely to put him a bit too much into the red to match the likes of Degenkolb and Sagan. Furthermore, he doesn't seem to be at 100% and several riders were clearly faster than him in today's sprint. On the other hand, the headwind will benefit Kristoff and if he can get to the top relatively fresh. The final kilometre with few technical challenges and a slightly rising road is tailor-made for him and he is usually faster than both Sagan and Degenkolb. We don’t expect Kristoff to win the stage but he is one of the select few who has the speed to beat the two big favourites. Another rider who likes this kind of uphill sprint is Bryan Coquard. 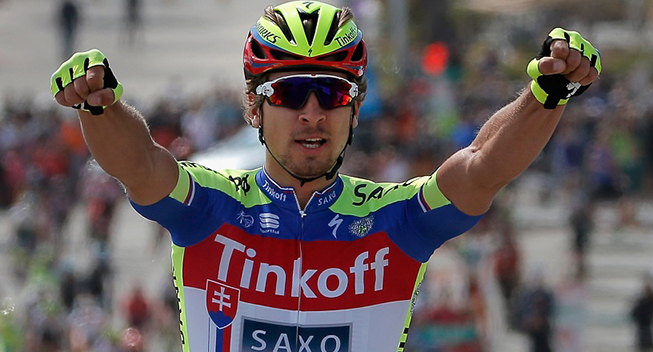 The Frenchman proved his good condition in the Route du Sud where he won two stages, including a tough uphill sprint. He has an amazing top speed in these finales and would even have preferred the finishing straight to be steeper. Furthermore, he usually suffers a bit in the fight for position but that won’t be much of a disadvantage in this finale. Unfortunately, he crashed in today’s stage and that could hamper him a bit. If he has the speed, he had in Paris-Nice and can get into a reasonable position, he has a chance to take the first Tour de France stage win of his career. Edvald Boasson Hagen is clearly in good condition. He looked strong on the cobbles and did an impressive sprint to take fifth. In fact he started the sprint very early and still managed to hold off a real sprinter like Bouhanni. Today he was again fifth despite having had to chase back from a crash in the finale. This long, slightly uphill finishing straight with a late climb is tailor-made for him. Will tomorrow be the day when an African team wins the first Tour stage? It is evident that Alejandro Valverde is far from his best condition. He rode poorly in the Dauphiné and his time trial, lazy positioning and performance on the Mur de Huy clearly indicate that he is still not at 100%. However, his ride on the cobbles proves that he is getting better and this stage could actually be an opportunity for him. He knows that he is likely to be a domestique later in the race and so he wants to win that elusive stage win as soon as possible. He would clearly have preferred a harder finale but he has beaten sprinters in the past, most recently in the Volta a Catalunya. Furthermore, he is good at timing his effort and he will definitely be one of the freshest at the top of the climb. Going into the race, Orica-GreenEDGE had four riders that could potentially win this stage but now they only have one card left. Michael Matthews has a rib injury and Daryl Impey and Simon Gerrans have both abandoned. Michael Albasini is now the designated captain for this stage but he is nursing injuries too. However, he is very strong in these uphill sprints and would even have preferred it to be harder. In the past he has won bunch sprints in WorldTour races when the racing has been sufficiently hard and he is faster than many expect. Unfortunately, he crashed again in today's stage. If he is not hampered too much by his injuries, he will be a strong contender. Davide Cimolai has flown under the radar in this race but he is a strong outsider for this stage. In Paris-Nice he beat all the favourites in a harder uphill sprint. This is where he really excels and there is no doubt that he has red-circled this day as a big opportunity. He has Filippo Pozzato to position him in the finale. With Rui Costa’s many setbacks, he could be the man to save Lampre-Merida’s Tour. Greg Van Avermaet has the freedom to chase success in a first week that is littered with opportunities for him. The cobbled stage was not selective enough and as expected, the Mur de Huy was too steep for him. His best chances are probably in Rodez and on the Mur de Bretagne but this stage is a good opportunity too. He did a very good sprint in stage 4 and is clearly in good condition. However, he is not fast enough to beat Sagan and Degenkolb and his best chance might be to launch an attack in the final kilometre. We expect the climb to be too hard for Mark Cavendish but Etixx-QuickStep still have a number of cards to play. One of them is Matteo Trentin who has won a stage in this race two years in a row. The Italian prefers a flat sprint after a hard race with a few climbs and this kind of uphill sprint is not tailor-made for him. Furthermore, he crashed in today's stage. However, he has proved that he has the speed to beat the best sprinters. If the finale is too hard for him, Zdenek Stybar and Michal Kwiatkowski could also show themselves in this kind of sprint. While the Pole is clearly not in good condition, the Czech seems to be flying at the moment. Tony Gallopin is having another impressive Tour de France and his ride on the Mur de Huy was much better than expected. The Frenchman just gets stronger and stronger and he will find plenty of terrain in this race. This finale should suit him well as he likes this kind of uphill sprint. However, he is unlikely to beat the faster riders and so might try his hand with a late attack. Last year he proved how hard he is to catch. Arnaud Demare has not had much success in the Tour de France but he actually seems to be in pretty good condition. He wasn’t expecting to get many personal opportunities in this race but with Pinot’s many setbacks, he will get more freedom. Today he tested himself but started his sprint too early. He excels in uphill sprints and would really have liked the finishing straight if he hadn’t had to go up the climb in the finale. That is likely to be a bit too hard for him but it won’t be impossible for him to be in contention. The same goes for Cavendish and André Greipel. On paper, the climb is too hard for them and even if they make it to the top with the best, they are unlikely to be fresh enough to beat the stronger guys. However, they will benefit from the headwind and both are clearly in very good condition. If the pace goes down in the final kilometre, they might get time to recover for the sprint. LottoNL-Jumbo have two cards to play in the sprint. Their main objective is to keep Robert Gesink safe but Sep Vanmarcke and Paul Martens could get their chance in the finale. Vanmarcke was extremely unfortunate with two late punctures on the cobbles but he seems to be very strong at the moment. Martens excels in these uphill sprints and last year he won the queen stage of the Tour of Belgium in a similar finale. Ramunas Navardauskas turned into a sprinter in last year’s race where he even finished third in Paris. In this race his main goal is to keep his captains safe but if things are okay, he might try his hand in the sprint. He is very poor at positioning himself but likes this kind of power sprint that is slightly uphill. If he can gets a clear run to the line, he has the speed to be up there. Cofidis lost Nacer Bouhanni who would have been one of the big favourites for this stage. Instead, they are likely to focus on Julien Simon who is a real puncher for this kind of uphill sprint. In 2012 he was in outstanding condition as he won two stages in Catalonia but since then he has not been at the same level. However, he had resurgence in 2014 when he won the Coupe de France overall and he recently showed good condition in the French championships and the GP de Plumelec. A strong joker is Vincenzo Nibali. The Italian is never afraid of attacking and he will be ready to grab every unexpected opportunity. If the pace goes down in the final kilometre and the sprinters have no domestiques left, he won’t hesitate to attack. It won’t be easy to hold off the peloton but if the GC riders are inattentive, nothing is impossible for the strong Italian.